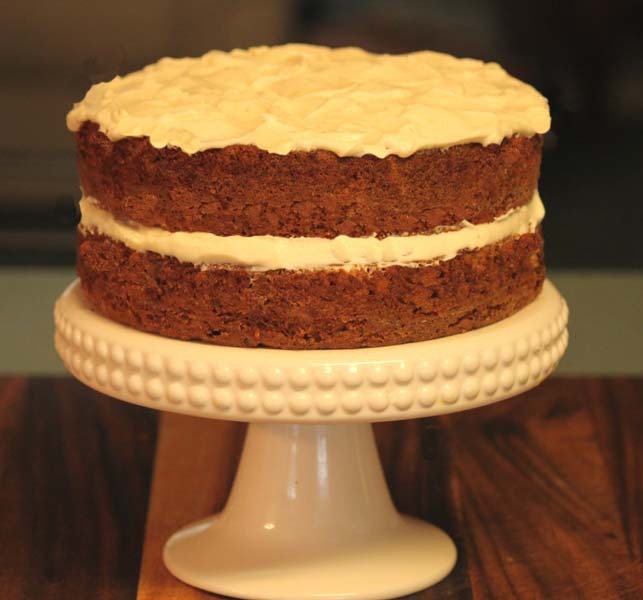 Banana Cake with Cream Cheese Frosting | Rosetta Bakes! I’m always looking for a new recipe to use up any ripe bananas to keep from throwing them away. I love bananas, but sometimes I buy too many of them! I hate throwing bananas away; so if there’s something I can bake with them…I’m there! lol This banana cake recipe has simple ingredients that you already have in your pantry, no rushing out to the store to get additional items. So simple, so easy and so delish! Beat sugar and butter; add eggs and mix well. Mix soda in with mashed bananas and add to mixture. Pour into a greased 13 x 9” pan or 2 (8-inch) pans. Note: You may want to half recipe if frosting middle and top only. If you decide to make the entire recipe, any extra may be saved as it freezes well. Note: Ever wonder why a lot of cakes are not level at the top and they have to be leveled off so they will stack perfectly? Well, this baking tip is one I use over and over to assure my cakes are flat. When I do get in a hurry, I have a cake leveler that I use, but when time allows, I wrap my cakes. Here’s an example photo to show you what I mean. I bought the Wilton wraps at Michael’s Craft Store, but I didn’t pay full price. The average price for the wraps are $20.00, but I used a coupon that allowed me to have 1/2 off…so be sure if you want to buy them, wait until you have a coupon! Now, if you don’t want to spend the money, just take an old towel and cut it in long strips and fold over several time. If you happen to sew, run a seam along the edge to hold in place. Once they are folded over, they usually hold their shape. FIRST and MOST IMPORTANTLY…soak your wrap in water!! Once the wrap is soaked through, gently wring out the excess water, but don’t squeeze all the water out. 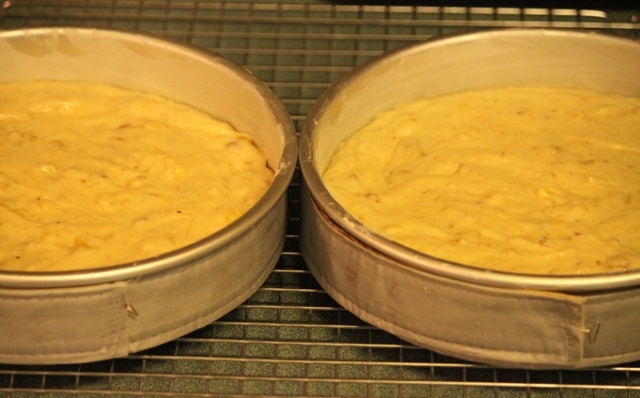 This soaking will help the wrap to maintain enough moisture to make it through the baking process. They will not burn, they may brown some, but they will not catch fire. Use a hat pin or safety-pin to hold the wrap in place. This banana cake was delicious. Made it for my husband this past weekend and between him and my grand-kids, it was gone in no time flat. Thanks for sharing. Thanks Shannon, it is a really good banana cake. Glad you and your family enjoyed it! Shannon, you have to try my Bllueberry Cake sometime. The blueberries are not in the cake, but between the layers of the cake. The icing is loved by so many because it’s sweet, but not too sweet. You can make the same cake using strawberries instead of the blueberrys if you like.